When I was a kid I couldn’t stand bbq sauce. 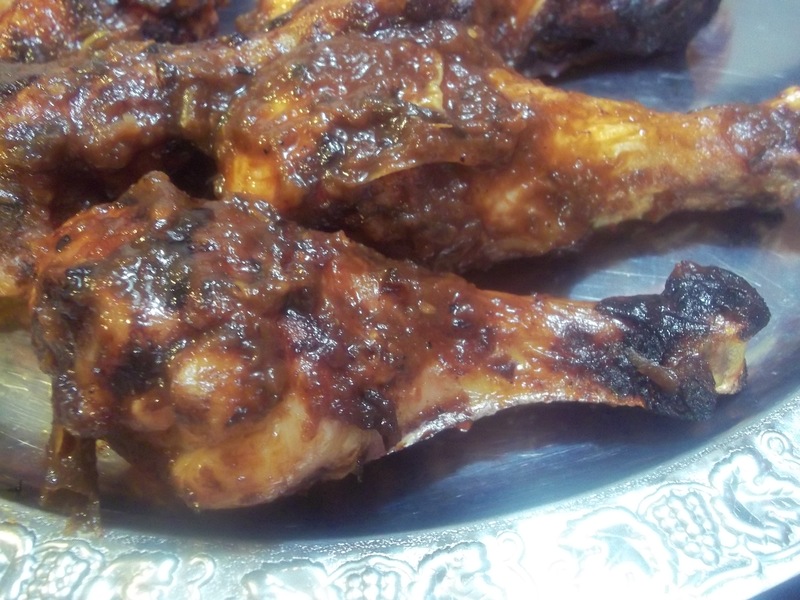 I loved grilled food and anything cooked over an open flame, it was the sauce all over my hands and face I couldn’t stand. I never minded mucking through the swamp to go fishing with Dad, but when it came time for a cookout, he knew to leave the sauce off of my piece of whatever. Six months away from home in a northern part of the country where Southern hospitality was unheard of and Southern cooking even more scarce, everything changed. There was a little bbq shack in the town we lived in, so twice a day, when I would drop my husband off at work, or pick him up, I had to drive past that little building with the smoke rolling out of a pipe in its roof. My craving for barbeque and bbq sauce grew until I finally couldn’t stand it any longer and bought all the fixings for a Southern bbq, using the first 99 cent bottle of commercial bbq sauce I came across in the supermarket. I’ve been a fan ever since. A few months later we moved to Hawaii. Good golly was that a whole other experience! The first month we lived there we treated like the honeymoon we’d never had. Day after day we spent driving around Oahu in a little blue rental car exploring beaches and coves. Around and around we went, poor as church mice, but loving the opportunity to live in such an amazing place. One of the things I remember most was the aroma, beach to beach, neighborhood to neighborhood, of locals grilling outdoors with their own homemade sauces. It was not Southern barbeque at all. We never did stop to ask anyone but I’m sure there were all sorts of interesting ingredients in what must have been Asian-based sauces, the smell was so unique. Our mouths would water as we would sit on some of the same beaches eating sandwiches we had packed for our outing until we finally bought a tiny little hibachi grill and started doing our own barbequing. We used that little aluminum grill until it rusted through and we bought our first full-sized charcoal grill. 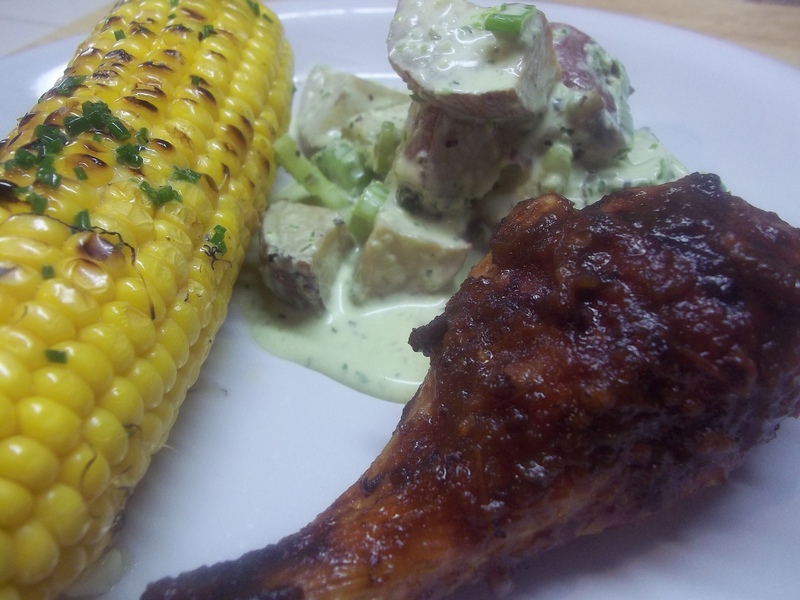 When we moved back to the South, years later, barbeque remained one of our favorite cuisines. 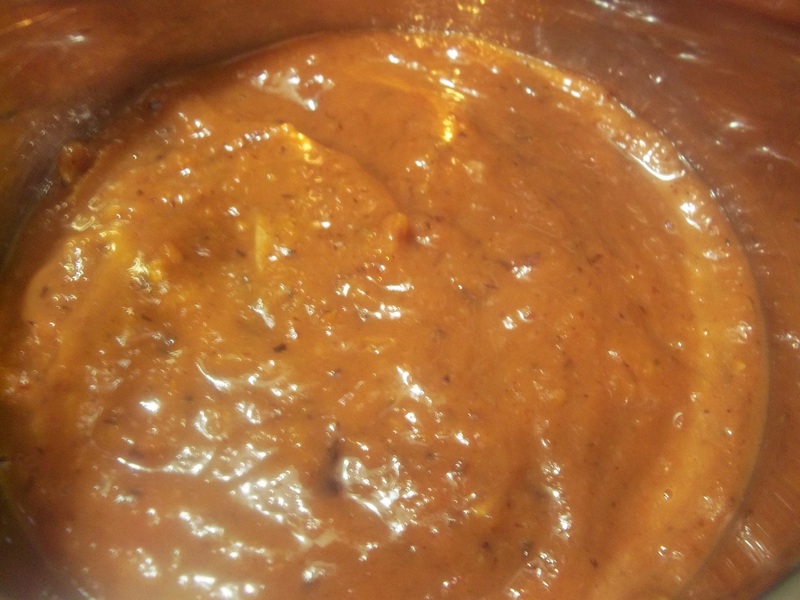 We don’t eat it out often, but I have enjoyed experimenting with making different sauces for grilling at home. 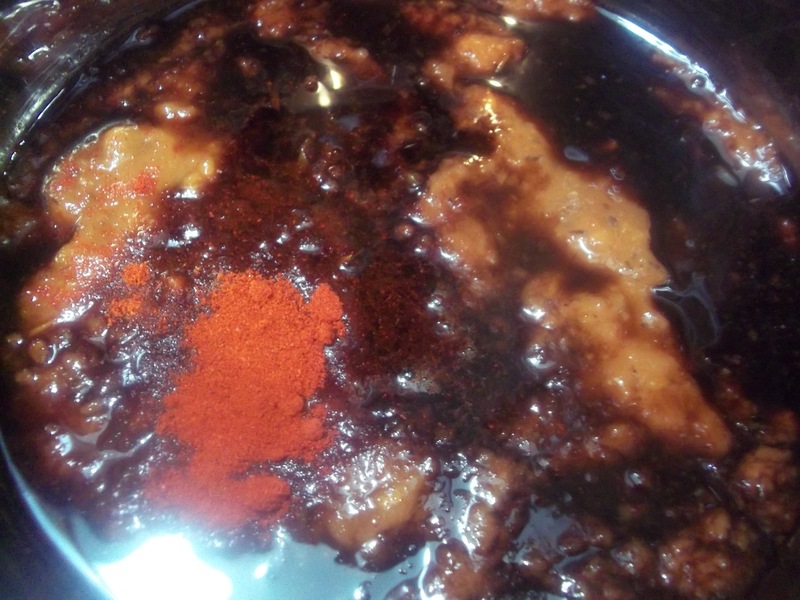 My favorite right now is an orange-based sauce that is made by a local barbeque restaurant. I make a version of that at home most often, but last year when I was having trouble keeping up with my tomato plants’ production, I had to double-time it to figure out ways to preserve all those plump, juicy fruits. I roasted a lot of tomatoes over the summer and found that bbq sauces and tomato sauces made with roasted tomatoes taste completely different than simmered tomato sauces. It’s very easy to do, nice to let the oven do your work for you while you take on other tasks around the kitchen. 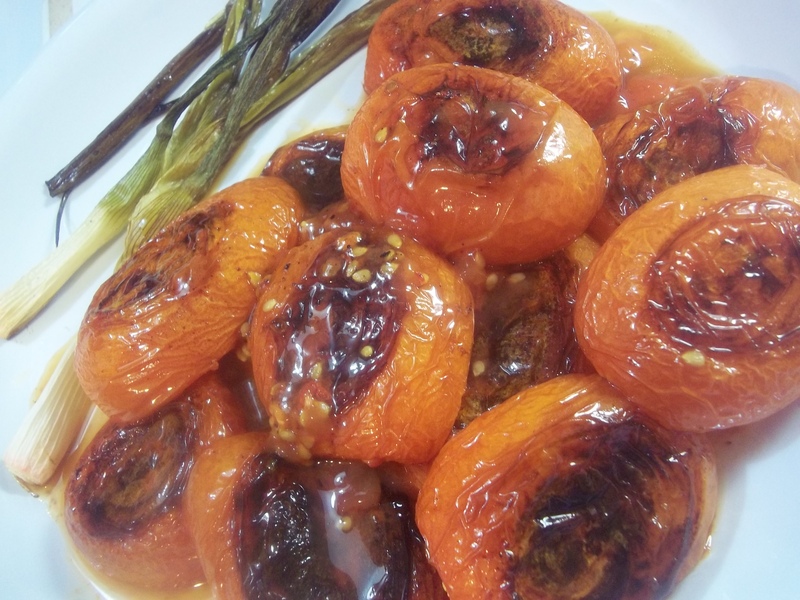 Here is a recipe for roasted tomato bbq sauce that I came up with a few weeks ago. I had planned to make it again for 4th of July weekend with my own tomatoes from the garden, but getting my tomatoes in late has delayed production. 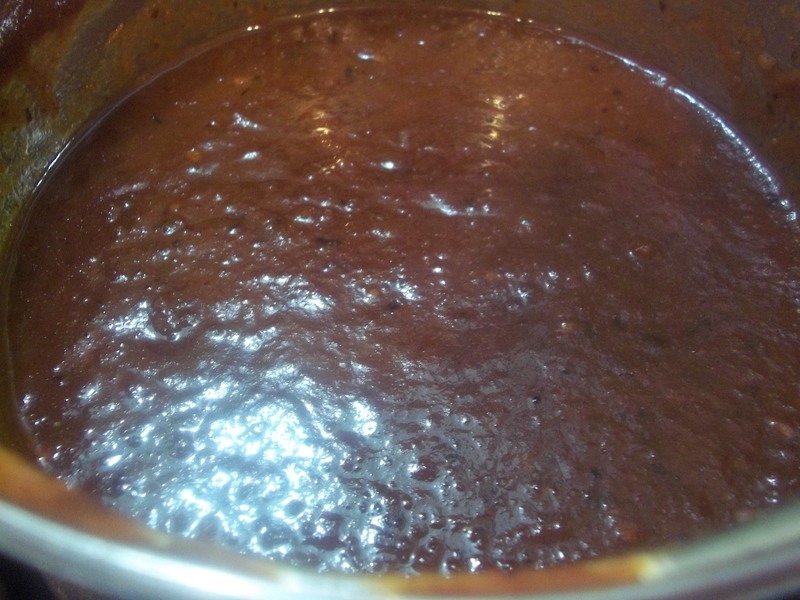 It is a mildly sweet sauce, so if you prefer vinegar-based bbq sauces, you can substitute white or red wine vinegar for the balsamic and decrease the amount of honey. Grease a large sheet pan with olive oil. 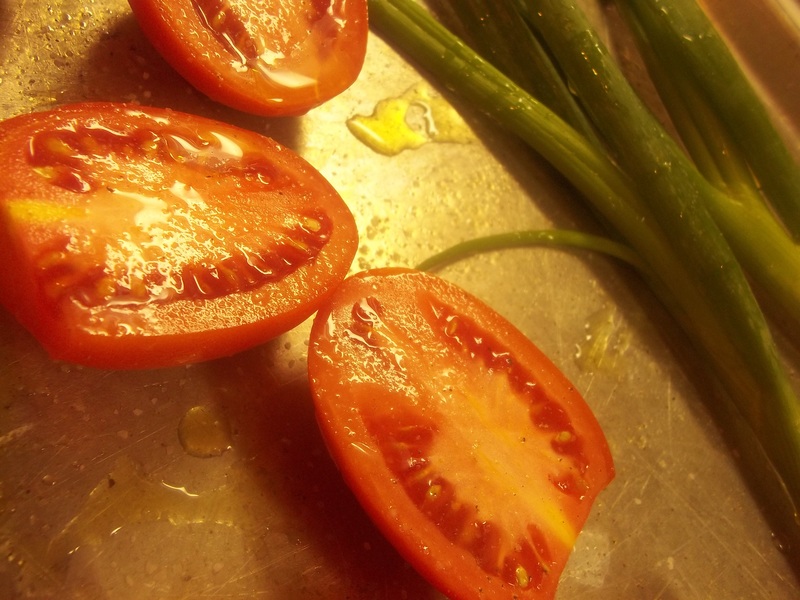 Lay tomato halves out, peel side down on oil. Lay scallions out as well. Drizzle with olive oil and season with salt and pepper. Roast in a 350 degree oven for 1 1/2 hours. Remove scallions at the 40 minute mark. Place cooled, roasted vegetables in the bowl of a food processor and puree. Add remaining ingredients and whir together until smooth. Transfer to a medium saucepan. Heat to a low simmer. Reduce heat to low and cook for 30 minutes to allow flavors to meld. Use on any cuts of grilled pork, chicken, or beef. What a lovely story. I like the imagine of the two of you sitting side-by-side eating sandwiches on the sand.